Grouping together three unfamiliar composers is always a risky business but the programme on this disc has been carefully laid out, and in the end it was a gamble that paid off to the full, musically of course. David Wynne was born in 1900 in Glamorgan, Wales but his career as a composer only took off in February 1945 when his String Quartet #1 was awarded the A.J. Clements prize. The Piano Sonata #2 was premièred in 1957 to great critical acclaim. Its idiom is contrapuntal, and the composer has described its harmonic and melodic style as basically modal with atonality. Wynne's one movement Third String Quartet (1966) divides into five interlocking sections separated by a pause in the music. Atonal and fragmentary, it is given coherence by a continual progressive energy which finally rests on the opening chord. 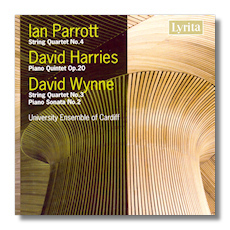 Ian Parrott was born in London in 1916 and in his substantial output one finds symphonies, concertos and a large number of chamber works. Completed in 1963, his String Quartet #4 is considered as one of his best compositions. Conceived in an arch-form, the piece lasts for only 15 minutes, but its imaginative use of material and great expressive economy show Parrott in his most serious vein. David Harries' Piano Quintet dates from 1964 when the composer was 31. Predominantly a lyrical work, the style is intentionally eclectic and is designed to appeal to the listener on a variety of levels. Performances are commendably vivid and precise, and the many changes of mood and colour are tackled with an amazing alacrity. An important issue in good sound and detailed notes, especially for the off the beaten track listener.